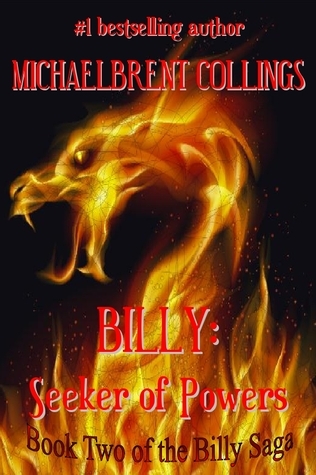 Billy: Seeker of Powers (The Billy Saga). Several years ago, when my son began to think seriously about writing novels as well as screenplays, he began talking about a new project, a young-adult novel focusing on a kid named Billy Jones. We heard about it…and heard about it…and heard about it. And then one day, it was finished. I thoroughly enjoyed reading BILLY: MESSENGER OF POWERS. From the jaw-dropping first sentence to the last it is a roller-coaster of landscapes both familiar and fantastic; of characters that invite and repel; and of situations that range from the mundane to the totally unexpected. The book is a deft blend of young adult narrative with themes and imagery that will appeal as well to adult readers–touching on the ancient concept of the Four Elements (here enjoying the addition of two more), the medieval tales of King Arthur, and Christ as Savior. Each of the levels is handled so adroitly that none stand out as mere ornamentation; everything in the book is integral to the story being told. This is a book that will appeal to a wide spectrum of readers of fantasy and young adult fiction. Highly recommended. Shortly thereafter, I wrote a more extensive response, which was posted on my then-website, Starshine and Shadows (at: starshineandshadows.com). I thought for a moment about re-posting it here in its entirety, the decided against it, since the essay is easily accessible. I do, however, wish to cite several paragraphs that relate directly to the sequel, Billy: Seeker of Powers. As a young-adult novel, Billy provides its readers with an engaging hero—a high-school freshman who, like many of its readers, feels totally out of place. To make matters worse, he is small, all five-foot nothing of him, and subject to frequent forceful insertion into empty hall lockers. He feels helpless…until circumstances introduce him to unknown Powers and give him a thorough education in power, its rightful uses, and its abuses. What follows is a roller-coaster ride of events, characters, landscapes, situations, and emotions, resulting in a Billy who, although still physically small, has grown significantly in all the ways that are important…. At its most fundamental, Billy infuses an archaic trope with new vigor. The underlying structure of Billy’s universe–or, more precisely, perhaps, multiverse–relies on the ancient classification of all matter as belonging to one or more elements: Earth, Air, Fire, Water. To the traditional four, the novel adds a fifth and sixth: Death and Life. Key characters represent Elements, at times even the essence of the Elements, exhibiting appropriate knowledge and powers. And, given the often contradictory characteristics of the Elements and the beings who personify them, Billy‘s worlds stand on the perilous edge of war, exemplified by the unbridgeable gulf between Life and Death. The novel expands upon this essentially Medieval/Renaissance world-view, including echoes of such crucial beliefs as the Music of the Spheres, an image for the fundamentally harmonic character of the universe when acting in concord to God’s will; and the entire panoply of associations implied by humoral psychology, in which the overriding element in one’s physical makeup parallels specific mental, emotional, and spiritual characteristics, including associations with colors, personalities, and age. Individual Powers dress, act, and think in accordance with their respective elements. Hence, one character is associated with Fire, wears red; is an active, vigorous young man; and is, appropriately, by profession a ‘fireman.’ The novel avoids making the identifications too blunt and obvious, but underlying each major character, one may see the Elements moving. Upon this foundation Billy builds a second archetypal level, this one associated with the mythic history of King Arthur. Arthurian touches occur, apparently randomly, through most of the novel, but the final chapters reveal the close interweaving of myth with world-view, ultimately introducing–in much the same manner as Spenser’s Faerie Queene—Arthur, not so much as acting character but as a promised presence in future books. Specific components of the mythos gradually reveal themselves as the novel progresses, until at its conclusion, they emerge directly to participate inexorably and seamlessly with the story. The novel handles the emergences adroitly, almost tantalizingly, until the Arthurian motifs crystallize sufficiently for younger listeners to become aware of them. The whole sub-structure is handled carefully and well, never overwhelming the surface story but supporting and enriching it. In addition, Billy: Messenger of Power penetrates to the core of both the ancient Elements and the Arthurian mythos to an even more fundamental sequence of echoes. J. R. R. Tolkien once discussed Fantasy-as-genre as leading, in its highest moments, to a sense of Eucatastrophe, that is, a single moment of overwhelming joy that echoes throughout past, present, and future. For him, the best fantasy gives us a glimpse of the ‘true’ eucatastrophe, the Incarnation of Christ at the central point of human history. Whether overly Christian or not, specifically religious or not, high fantasy leaves readers in an emotional state that parallels that of the most intense religious experience. Billy attempts—and to a large extent succeeds—In creating the sense that, underlying the surface story, with all of its archetypes and echoes, is a greater story, one dealing ultimately with redemption and regeneration. Scriptural allusions begin with the title itself … Billy: Messenger of Power. A messenger is ‘one who is sent out,’ an ‘apostle’ in the earliest Greek and Latin senses of the word. There is a nicely comic sense in the juxtaposition of Billy’s commonplace name with a word that mediates between him and “power.” The allusions continue with references to a grand Council and an early battle that separated the Powers into forces of light—the Dawnwalkers—and forces of darkness—the Darksiders. The Dawnwalkers are committed to allowing humanity its freedom to act; the Darksiders to ruling and subjugating. There are Christic references throughout. There is an Anti-Christ, one who asserts himself as the true Messenger of the King. There is a revelation scene reminiscent of Christ’s temptation on the pinnacles of the Temple or Moses’ visions upon a high mountain. There is a sealed book, only one-third of which can be read. There is even a character swallowed by a whale à la Jonah. Even given all of this, Billy carefully avoids being simply Arthur-warmed-over or Christic-imagery-sprinkled-about. It tells its own story, creates its own memorable characters, defines its own unique landscapes, and arrives at its own inevitable but satisfying conclusion. Since publishing Billy: Messenger of Powers, Michaelbrent has published something like a dozen novels, mostly horror, mostly geared toward adult readers, some quite dark, some downright scary. Billy: Seeker of Powers shows how much that interim writing has helped him develop as a writer. The narration in Billy 2 is much smoother, the characters deeper and more richly developed, the handling of mythology—both overtly and through some rather interesting allusions—more complex and at the same time more understandable. In this second volume of the saga, Billy must locate five weapons to fulfill a prophecy that he does not even begin to understand. To make matters worse, none of those helping him know much more about it than he does. And to further complicate matters, as he sets out on his various quests, he discovers that the Powers—Earth, Air, Fire, Water—have begun a desperate battle of conquest, with Life itself in the balance. Billy has matured much from his earlier struggles in Billy 1 and faces each challenge with a courage new to him; and even more, he begins to understand who he truly is and what his role in the conflict is to be. He must bear up under pain and suffering, including the deaths of many around him…and discovers the true villain of the piece, the one behind the cataclysmic battles that take place. At this point, the multiple levels alluded to in Billy: Messenger of Powers (and in the paragraphs above) begin to expand beyond the rather programmatic usages in the first novel to become symbol and archetypes that demand attention for their own sake. The Elements not only exist; they war against each other. The Powers not only control matters of life and death; they can themselves die…and several do. The essentially superficial division between Dawnwalker and Darksider disappears as, bearing weapons that begin the serious fulfillment of prophecies, Billy literally commands them to stop battling; he reveals to them the ultimate struggle (presumably to be defined in the third volume)—the battle between Life and Death. Billy: Seeker of Powers releases the Arthurian Mythos in all of its power, meshes perfectly with the traditions while at the same time making those traditions its own. And the religious overtones in the first volume continue, muted by the increasing awareness on Billy’s part of who and what he is…he is not a Christ, not yet and perhaps not ever; but he is the wielder of armor with godlike power that demands as much of him as it gives. And he willingly makes the necessary sacrifices. In the end, Billy: Seeker of Powers leaves us ready for—eager for—the third (and final?) volume as the earth, the people on it, the surviving Powers, and Billy himself accept their roles in a coming confrontation that might well destroy all of them. Solid writing, good characterization, wildly imagined landscapes and events—Billy 2 is highly recommended. I don’t read a lot of YA books, but this series sounds very good, with the kind of depth that I look for (but all too rarely find) in YA novels.